Green Lantern comic books, published by DC comic books, featured test pilot Hal Jordan who was chosen by the Green Lantern Corps to be Earth's protector. This series was inspired by the golden age Green Lantern. Written by Gardner Fox and drawn by Gil Kane originally, this Green Lantern first appeared in Showcase #23 and 24. We have 111 of the 205 issues. The Strange Trial of Green Lantern! The Trail of the Missing Power Ring! 1st Appearance of The Green Lantern Corps. Peril of the Yellow World! Zero Hour in Rocket City! The Defeat of Green Lantern. The Trail of the Horse-and-Buggy Bandits! Master of the Power Ring! Dual Masquerade of the Jordan Borhters! The Shark that Hunted Human Prey! The Strange World Named Green Lantern! Origin of The Shark. 1st Appearance of The Shark. War at the Weapons Wizards! Green Lantern comics are among our best selling comic comics. For readers who buy Green Lantern comic books, this is the place. The original Green Lantern series is the most sought after series. But other Green Lantern comic books are for sale. These other Green Lantern series range from 1 issue stories (one-shots) to ongoing series, such as Green Lantern Corps. Buy Green Lantern comic books at NewKadia and they all have a 100% money-back guaranted. So, if to collect or buy Green Lantern comic books, here they are. The 2011 Green Lantern movie moved Green Lantern way up our best seller list. DC is still behind Marvel when it comes to creating great movies, but the Green Lantern movie did well at the box office. Since the movie, the demand for Green Lantern comics has grown. The movie is based on DC's silver age Green Lantern, test pilot Hal Jordan. He was always at the top of DC's second-tier of heroes, behind Superman, Batman and Wonder Woman. If you're a long-time collector, you know that Hal Jordan wasn't the first Green Lantern, nor the most recent. The original Green Lantern appeared in All-American Comics #16 in April of 1940. When comic book sales sank in the early 1950s, DC's superheroes (with the exceptions of Superman, Batman and Wonder Woman simply disappeared. Then, in 1956, DC re-launched a new reincarnation of the Flash, followed in 1959 with a re-boot of Green Lantern. 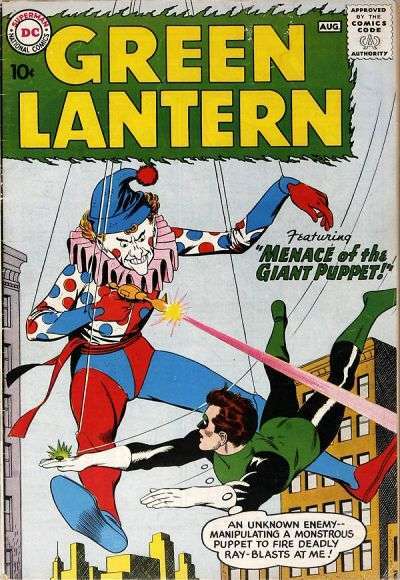 The next year, DC gave the character his own book, Green Lantern (1960 series). The series is best known for groundbreaking issues #76-89, starting in 1970 (later reprinted in the series Green Lantern/Green Arrow). Writer Denny O'Neil and artist Neal Adams pitted the sensibilities of the law-and-order-oriented Lantern with the populist Green Arrow. The 14-issues broke the 31-year DC tradition of every superhero being a goody two-shoes. For the first time, DC heroes had multi-faceted personalities. Of course, it took DC nine years to figure out why Marvel Comic characters had sky-rocketed in popularity, but with these issues, many readers believed that this DC team had taken exceeded the best efforts of Marvel. The stories were critically acclaimed, with publications such as The New York Times, Wall Street Journal and Newsweek citing it as an example of how comic books were "growing up". Here's the trailer from the 2011 movie.